Parsley stems have a stronger flavor than the leaves, but both are used to flavor sauces, soups, salads, omelets, and stuffings. It can be used as a decorative garnish for virtually any dish, but do not reserve it to use just as a garnish. Use parsley generously—entire stems with their leaves. In fact, 1/2 cup (20g) of chopped parsley is not too much when combined with small boiled potatoes and butter. You can include it in steamed and blanched vegetable dishes, as a base for salad dressings, as a sauce ingredient, or generously strewn in soups and casseroles. Soaking parsley in a marinade of oil and lemon juice or sautéing it with onions and tomatoes can improve its taste-enhancing properties. Parsley is popular in Brazilian cooking where it is used to season onion or shrimp pies, potato and egg dishes, hearts of palm, seafood casseroles, and poultry. It’s also one of the basic French cooking herbs, often combined with chervil, and appears in the classic herb combination fines herbes, which usually features chervil, chives, parsley, and tarragon. 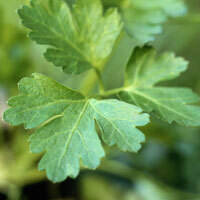 Parsley’s also an excellent natural breath freshener.